Although its history goes back a thousand years, Gdansk represents one of Poland's most modern urban centers, its thriving economy boosted by a lively tourism sector. A major seaport for ages, the city saw some of its best and worst moments in the middle of the 20th century. Nearly leveled in World War II, Gdansk painstakingly restored its medieval architecture during subsequent decades, transforming itself into one of Europe's most visually appealing port cities. The historical central district--the starting point for most sightseeing tours--remains a compact area, offering easy foot access to numerous monuments, museums, and restaurants. 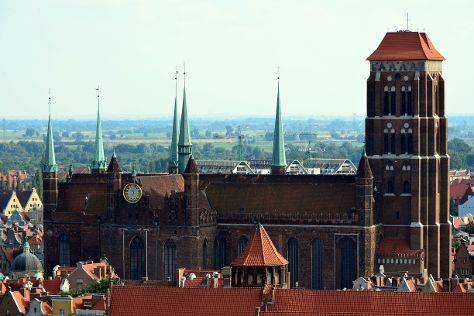 To explore Gdansk's diverse outlying neighborhoods, use the city's public transport system. Gdansk is in Pomerania Province. When using our Poland trip planner to make an itinerary online, Gdansk holidays come together around your tastes, interests, and requirements, with us taking care of the logistics. The suburbs of Gdansk boast plenty of affordable hotels and hostels, offering inexpensive rooms even at the height of the season. Easily accessible by train, neighboring Sopot provides additional sleeping options, including good-value guesthouses and mid-range hotels located mere minutes from the Baltic Sea. If you prefer to stay in Gdansk itself, explore the city's self-catering apartments with free Wi-Fi and cable TV. Alternatively, check out the upscale old town hotels, many of which offer discounted rates on the weekends.